18 holes, par 72, 7,230 yards. Links. Just a 10 minute drive down the coast from the illustrious town of St Andrews is the Torrance golf course, one of two courses onsite at the five star Fairmont St Andrews. 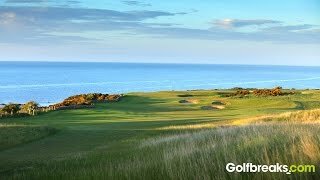 The course carries the name of the legendary Scottish golfer Sam Torrance, but it was in fact co-designed with Dennis Griffiths who is also responsible for the Kittocks course onsite, and what superb creations they are. Although the Torrance course can’t be classified as a links per say due to the type of land it’s built upon, it is every inch as much a links golf course as can be; exposed to the incoming coastal winds; pot bunkers which typify these links and electric fast greens. This is no mere pushover and testament to this is the regular top-level tournaments the course hosts including most recently The Open Championship qualifying, The European Seniors Tour and The Scottish Seniors Open. Expect stone walls to come into play, long gorse, multiple doglegs and hidden burns. Naturally any golf course within 5 miles of the Old Course at St Andrews is going to be unfairly judged, but the Torrance course is of equal measure to many of the other courses littered around the St Andrews area. As you would expect from a 5* property, the Clubhouse and onsite services are top class and provide the perfect area within which to relax when on your Scottish golf holiday. Soak in the beautiful views across to the town of St Andrews and the Eden Estuary.